Safety PLCs of the JetSafeControl series by Jetter AG make implementing safe drives as easy as a walk in the park - all major safety functions have already been integrated into the firmware of this controller series. Furthermore, the software tool JetSafe lets you adapt the safety functions to the individual safety concept, and enhance them. In JetSafe the corresponding sensors and functions of a machine are assigned to inputs/outputs of the devices and the safety PLC. All major control devices and sensors used in safety technology, such as light curtains, door contacts, enabling keys, emergency stop devices, etc. are preconfigured and can be selected by clicking the corresponding icon. In the function chart the monitoring functions (SS1, SS2, SOS, SLA, SLS, SLP, SDI, SSM) are then linked with logic operations. This can be done on the programming interface quickly and easily just by using drag & drop without having to write any program code. Stops, speeds, accelerations, positions, ranges and directions of several axes are monitored as regards their relation to each other. These functions can directly be parameterized in JetSafe in a context-oriented way. JetSafe automatically creates a terminal diagram and links the elements with the safety module to which they are connected physically. 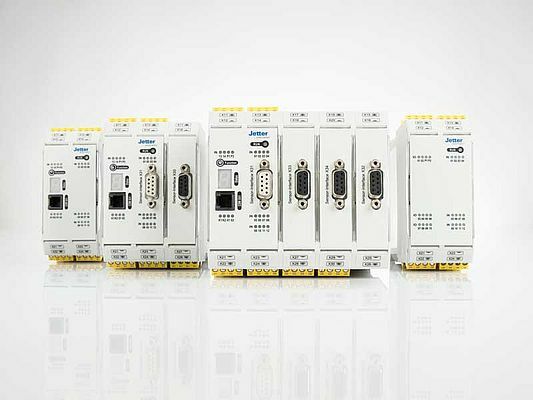 Safety modules that have already been tested are managed in a library, and can be used for other drives or projects. In addition, the library lets you define modules of your own, protect them or save them for future reuse. Once the safety controller, as well as the sensors and actuators have been configured, JetSafe automatically creates the wiring diagram. The controller series JetSafeControl comprises four models ranging from 100x115x45 mm to 100x115x122.5 mm which are approved up to PLe EN 13849, or SIL3 EN 61508. All drive monitoring functions to EN 61800-5-2 are supported. They feature up to 58 safe digital inputs, 22 safe digital outputs, up to 6 signaling outputs, as well as a safe relay output for isolating circuits.